As a wonderful resource to support skills and knowledge across many curriculum areas we have introduced the Woodland School based on the Scandinavian and Forest School principles. Extensive natural woodland lies adjacent to the school so why not tap into this rich learning resource? Through experiencing learning in the natural world children gain a sense of responsibility and value for their environment in addition to confidence, self-esteem and developing a sense of awe and wonder of the world. From choreographing creative dance routines to measuring tree girths, to compiling a list of descriptive words as spring unfolds in front of them to hunting for mini beasts there is something inspiring for everyone. suits as part of their uniform but school also has spare sets. Woodstreet School adheres to health and safety precautions which includes a comprehensive risk assessment. Although we consider eventualities that may occur and set out how we would eliminate the risks, the nature of the activity does involve an element of risk but we feel children need to learn to manage risk within a controlled environment. A qualified first aider always accompanies every visit. 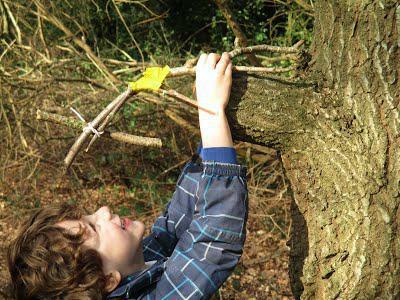 We are always looking for adults helpers to join the classes for their Woodland School activities. Adults have the opportunity to respond to the children’s needs, listen to their thoughts, observe how they play and work together and be thoughtful about how we might support children’s next steps in their learning. The Woodland School allows children to develop a sense of care and thoughtfulness for the woodland environment and time to develop their exploratory and creative drive, time to be curious, ask questions and find their own answers. 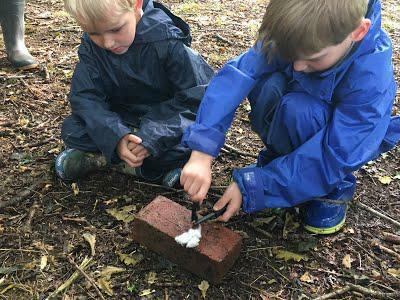 Here at Wood Street School we have developed a carefully planned progression of outdoor learning skills which we feel enhances our curriculum and creates children who are well rounded explorers.